shingles are the most common type of material used for today’s pitched roof residential applications. There is such a huge variety of colors, shapes, sizes and warranties that can help to make it easier to find the right type of shingle for your needs. A very common question that we get is: will my new shingles become stained as my old ones did? Answer: It can because staining is most commonly caused by algae. Although sometimes wrongly called fungus, the dark stains on roofs are usually caused be algae like we find in swimming pools and on the grout between tiles in bathrooms. 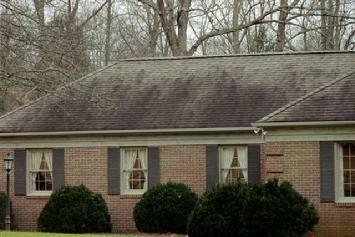 An alga staining is most prevalent in areas with significant humidity; it can make a roof unsightly. Plus the dark stains tend to absorb more ultraviolet light; which might cause some degree of additional heat build-up in a poorly ventilated attic. To fight algae, some manufacturers make a shingle witch has algae resistant granules on the weather side. Two granules have been used for this purpose: Zink metal and copper oxide coated granules. At this time, copper oxide coated granules is the most commonly used. Founded in 1886, GAF has grown to become North America’s largest manufacturer of commercial and residential roofing.Professional installers have long preferred the rugged, dependable performance that only a GAF roof can offer, and have made it the #1-selling brand in North America.Our success in growing the company to nearly $3 billion in sales has been based on our unique philosophy of helping. More property owners choose GAF for their roofing project—why trust your most valuable asset to anyone else? When a roof can account for as much as 40% of the average homes exterior, many factors weigh into the choice of materials. Some surfaces are more beautiful than others. Some offer greater resilience or endurance. Some are more affordable. But the one roofing surface which offers all those attributes in balance is the asphalt shingle. Now accounting for about 80% of the residential roof surfacing in the United States, asphalt shingles are measured against a variety of standards that evaluate fire and wind resistance, tear strength, and other key performance indicators. For fiber glass shingles, ASTM D3462 is considered the most important.This comprehensive standard covers tear strength, nail-pull resistance and pliability, among other shingle characteristics. Over 20 CertainTeed fiber glass shingles are independently certified by Underwriters Laboratories to meet the tough ASTM D3462 standard.